Mike's latest book, Tracing Your Birmingham Ancestors will be published by Pen & Sword in April 2015. Its publication is timed to coincide with the Who Do You Think You Are? Live Show at the NEC. As an experienced researcher, Mike saw a gap in the market for a self-help guide for family history enthusiasts with interests in the Birmingham area. In Tracing Your Birmingham Ancestors he provides a wealth of information, including websites, that will be of use to anyone just starting out on their family history journey. Having cut his teeth in the pre-Internet era, Mike appreciates the importance of hands-on research with original documents, so there are plenty of references to archive sources as well. 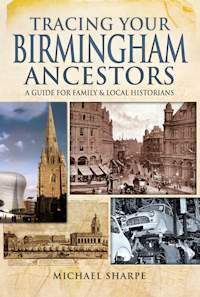 The book also gives a whistle-stop tour through the history of Birmingham to give readers a flavour for how our Brummie ancestors lived and the changes they experienced as this wonderful city grew around them. Tracing Your Birmingham Ancestors introduces readers to the numerous sources available, providing an essential guide for anyone researching the history of the city or the life of an individual ancestor. Many of these archival holdings are of national and international significance, yet research in Birmingham can be a challenge because rapid population growth, frequent boundary changes and the city's position straddling three counties mean that family and local history resources are widely dispersed. The book addresses novices and experienced researchers alike, offering a compendium of sources from legal and ecclesiastical archives, to the records of local government, employers, institutions, clubs, societies and schools. Accessible, informative and extensively referenced, it is the essential companion for research within Britain's second city. Mike's first book, Family Matters: A History of Genealogy (Pen & Sword, 2011) charted the development of family history as a popular pastime. He also researched and wrote a history of his family history society for its fiftieth anniversary in 2013 and has published several magazine articles on genealogy and local history.